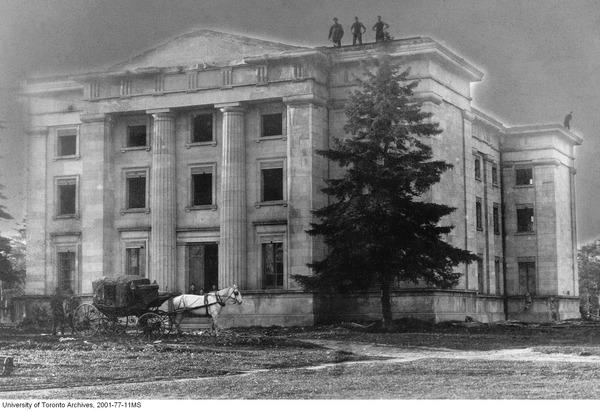 Demolition of King’s College Residence, 1886. (University of Toronto Archives 2001-77-11MS) This figure illustrates the ‘original’ building of what is now referred to as the University Toronto. The building was completed in 1845 and demolished in 1886 following a period as an asylum. This dissertation addresses the university student as a figure of mental health and illness. Drawing on the methods and theories of disability studies, interpretive sociology, critical, feminist and queer theory, as well as hermeneutically oriented phenomenology, my work explores the social production of this student figure or type – variously depicted as ‘ invisible’, ‘maladjusted’, ‘stressed’, ‘difficult’, sensitive’, ‘resilient’, ‘narcissistic’, and extraordinarily ‘ordinary’. This figure is addressed as a means of revealing contradictory understandings of the relationship between success and survival, as this relationship appears in the ordinary daily life of the University of Toronto, Ontario, Canada. The social and historical significance of the contemporary University’s Student Life Programs and Services is analyzed with a view to reveal the Western cultural values and practices which organize consciousness of success as a necessary condition of contemporary existence. Special attention is paid to the cultural production of knowledge concerning university student ‘mental life’, the appearance of which is located at the interstices of colonialism, global health policy, institutional ‘best practices’, cultural mores and folkways, and embodied experiences. I dwell with this appearance as an occasion to engage the materiality of Western mythologies of resilience, and with them the meaning of human agency under neoliberal governance. This engagement examines the productive power of the disciplinary and institutionalized ‘language of mental illness’ through a genealogy of the University of Toronto, a textual analyses of the University’s Student Life Programs and Services literature, and a discursive analysis of open-ended interviews with student services representatives which seeks both to understand and transgress conventional interpretations of the structure of Student Life. I demonstrate how University presentations of student bodies, minds and senses perceived to be lacking in ‘ordinary order’, can be reconceived as sites to reflect on the paramount presence of psychiatric knowledge in interpretations and responses to embodied difference within the university setting. Overall, this dissertation seeks to disrupt unexamined relations to the meaning of student types; and in the process, display how normative relations to the student as a figure of mental health and illness needs is currently and historically organized and socially achieved. Dr. Katie Aubrecht graduated in November 2012 and is the current President of the Canadian Disability Studies Association, Associate Editor (Forums) of Review of Disability Studies: An International Journal, Canadian Institutes of Health Research Postdoctoral Fellow and Assistant Professor with the Department of Sociology at St. Francis Xavier University in Nova Scotia. Her current research examines the discursive construction of dementia and the politics of person-centred residential dementia care.